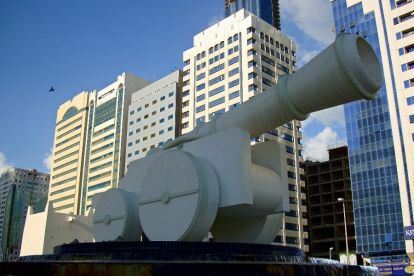 The cannon in Abu Dhabi’s Al Ittihad Square before its disappearance. Just as England has its traditional symbols of cricket and double-decker buses so the UAE has its palms, pearls and falconry and just as London has the Tower of London and Trafalgar Square, so Abu Dhabi has Qasr Al Hosn and Al Ittihad Square. Stranded between the lanes of traffic that dominate the stretch of Airport Road between Hamdan Street and the Corniche, Al Ittihad Square is an architectural statement of national identity that employs Emirati cultural symbols such as a traditional incense burner (mabakhir), coffee pot (dallah) and a conical palm-frond food cover (makkabah) on a monumental scale. Even as recently as the last Qasr Al Hosn Festival, when the monuments underwent a makeover, the square was the stuff of tourist postcards, but now it sits surrounded by construction hoardings and signs announcing the “Al Ittihad Square Revitalisation Programme”. The details of the programme are yet to be made public but what is certain is that Al Ittihad Square is already missing one of its monuments, a giant cannon that once confronted the cars as they drove towards Abu Dhabi’s Corniche. The cannon’s demolition is just one of the latest changes to a neighbourhood that for years represented the heart of the city. Not only was the area the home of Abu Dhabi’s original souq, now in its third iteration as Foster + Partner’s World Trade Center Mall, but it also housed its first bus station, clock tower and one of the city’s most elaborate mosques, the many-minareted Al Fahimi. Abu Dhabi is a palimpsest where the past is repeatedly overwritten by the present, and the area around Al Ittihad Square is one of the places where the traces of the city’s history lie thickest and deepest. Those layers of Abu Dhabi’s past are of interest to Yasser Elsheshtawy, associate professor of architecture at the United Arab Emirates University in Al Ain and the editor and author of books such as Dubai: Behind an Urban Spectacle (2013) and The Evolving Arab City: Tradition, Modernity and Urban Development(2011). Elsheshtawy has recently made a study of the architectural symbols that have been used in the projection of Emirati identity at World Expos and biennales. Elsheshtawy describes this direct reproduction of traditional objects and forms as a first step towards an increasingly mature Emirati architectural identity. For Elsheshtawy, however, there is still some way to go before the UAE moves from a literal or meta­phorical form of self-expression to the kind of abstraction and conceptualism that was displayed by pavilions such as Thomas Heatherwick’s for the UK in Shanghai. Elsheshtawy will be taking part tomorrow in a panel discussion to mark the publication of Modern Architecture in Abu Dhabi, 1968-1992, a guide to 30 of the capital’s buildings that is the result of fieldwork, interviews and archival research by students from NYUAD. The discussion is being moderated by Mo Ogrodnik, associate professor of film and new media and the principal investigator of FIND, the guide’s publisher. She will also be joined by Pascal Menoret, the guide’s editor, and Sherina Al Sowaidi, one of its contributors and authors. The discussion will tackle the complex conservation issues facing Abu Dhabi and the factors that have helped shaped the city’s urban landscape. Perhaps even the fate of the overlooked and unloved Al Ittihad Square will be on the agenda.